the journey to find the Chalice of Healing begins. 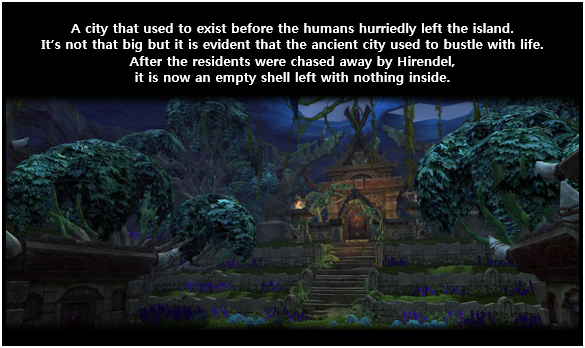 and has hidden them in Meriendel’s ash casket. 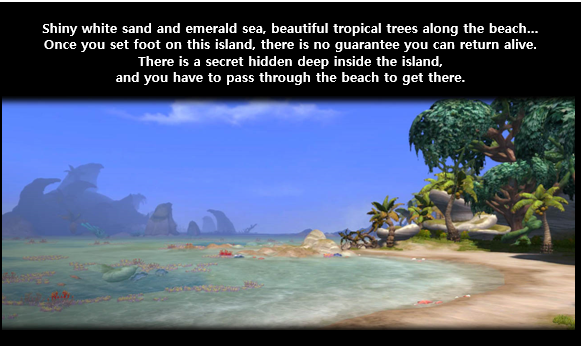 Following those clues, the team arrives at a beautiful tropical island, Chiron Island, located west of Merca. With Rubinart gone, Grele is the Anti-Goddess Faction’s last hope. and the hungry wolves who have smelled the scent of blood have started to come out of the shadows. You must ward off the forces of Mistland that are slowly revealing themselves. Protect Grele and find the Chalice of Healing. A ferocious tyrant who terrorizes the beach. He is under Child Hirendel, the lord of Chiron Island, and is in charge of the beaches. His vicious nature keeps the beach creatures in the area under control. 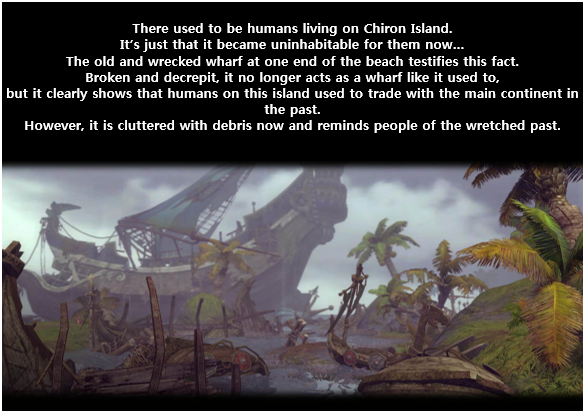 One of the survivors of Hirendel’s human massacre. and Hirendel resurrected them with magic. Being neither fully alive nor dead, they roam the island and protect Hirendel’s land now. Master of monkeys and the ruler of the forest. 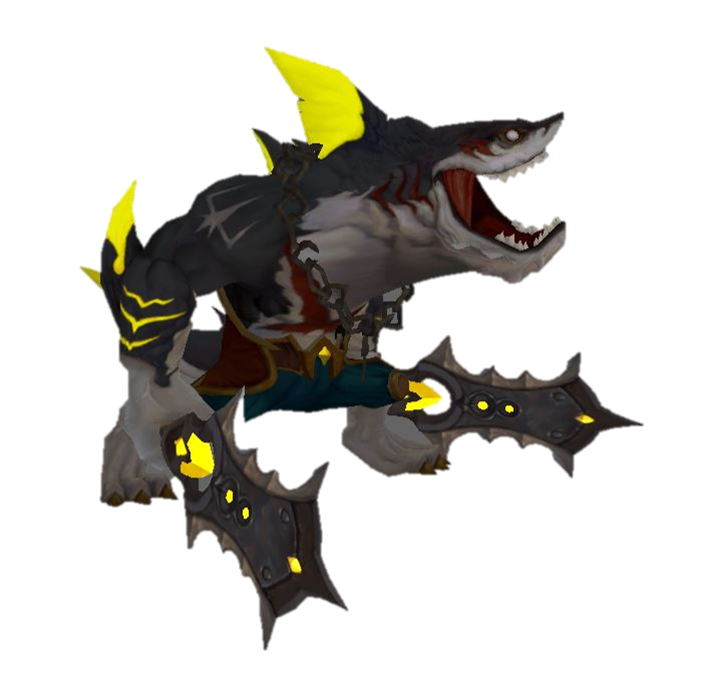 He is one of Hirendel’s favourite pets. 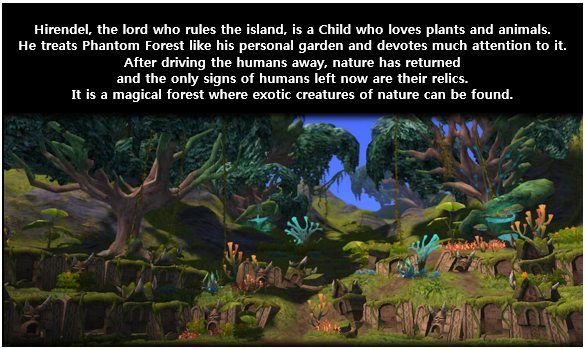 As a gardener who tends to Hirendel’s garden, he resides in Phantom Forest. A guardian created with alchemy to protect the city and the residents. With its master gone, it remains in the rubbles of the city, with only the instinct to keep intruders out left in him. Plant and animal-lover Hirendel has created a monster that has both plant’s and animal’s traits. Hirendel is highly fond of this chimera, as well as all creatures in the cave which are mostly his creations. 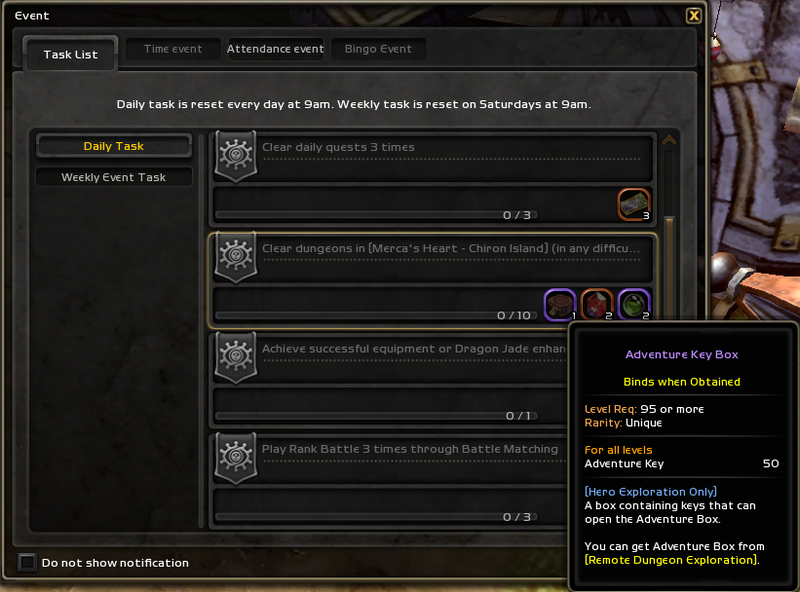 New titles can be obtained from the new dungeons. - [Class Mastery III] skill has been added to all 2nd Specialization skills (including spinoff characters). 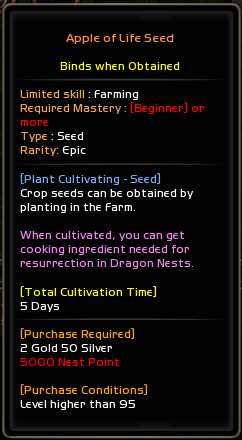 - [Class Mastery III] is not applied in PVP. [Heavy Slash]'s damage and attack area are increased. After using [Heavy Slash], follow up with [Finish Attack EX] to jump and attack immediately without lower slash and damage is greatly increased. However, damage dealt will be fixed instead of being relative to enemy’s HP. [Impact Wave]'s damage increases and is changed to shoot sword energy in front. After using [Impact Wave], follow up with [Moonblade Dance EX] to jump low and quickly shoot 6 powerful sword energy at enemies in front. [Impact Punch]'s damage and attack area are increased. After using [Impact Punch], follow up with [Demolition Fist EX] to slam down immediately instead of punching and slam down one more time when enemy is hit. Additional damage is dealt on enemies with [Fracture]. [Circle Break]'s damage and attack area are increased. After using [Circle Break], follow up with [Ring Bombs EX] to create shockwaves nearby. Additional damage for direct hits on targets nearby increases but small explosions will not occur. [Rising Slash]'s damage and attack area are increased. After using [Rising Slash]’s second additional hit, enter [Normal Attack Button] to shoot [Piercing Crescent] in an X-shape to increase attack area or enter [Jump Button] to reduce [Dark Crash]’s maximum charging duration. [Piercing Shot]’s damage and arrow size are increased. After using [Piercing Shot], follow up with [Charged Shot EX] to spend one Wind Arrow to shoot [Small Wind Shaft]. [Magic Arrow] does not pierce through enemies and now explodes when it hits the enemy. Causes multiple hits when it explodes. After using [Magic Arrow], follow up with [Tracking Arrows EX] to shoot normal [Tracking Arrows EX] rapidly and increase the damage of [Fatal Tracking Arrows]. [Twin Shot]’s damage and arrow size are increased. Also, [Twin Shot] can now be used in the air. After using [Twin Shot] on the ground or in the air, enter [Special Attack Button] to follow up with [Double Somersault Kick EX]. [Willow Kick]'s damage and attack area are increased, The character shoots up higher. After using [Willow Kick], damage increases when [Eagle Dive], [Flash Kick], and [Spiral Edge] are used. [Magic Arrow]'s damage and attack area are increased. Attribute is changed to Light Attribute and can now be used in the air. After using [Magic Arrow], damage of [Tornado Shot] and all [Holy Skills] are increased for a while. [Flame Burst]'s attack area, damage, and cooldown time are increased. After using [Flame Burst], follow up with [Flame Road EX] to greatly increase casting and movement speed of [Flame Road EX] and create more flames. 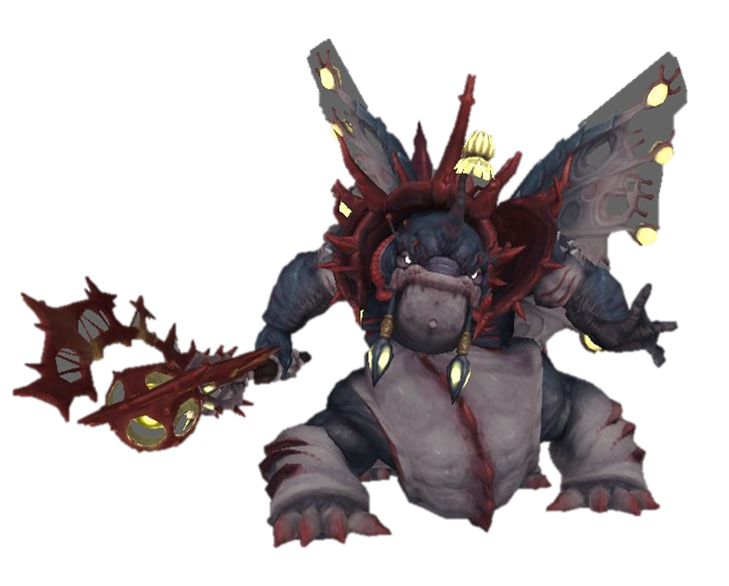 [Glacial Spike]'s damage and cooldown time are increased and is changed to fall onto the ground. After using [Glacial Spike], follow up with [Icy Shards EX] to simplify action and the damage of third [Icy Shards EX] which is used after full cooldown is increased. [Shock Wave]'s attack area and damage are increased and cooldown time is reduced. After using [Shock Wave], follow up with [Laser Cutter EX] to shoot [Laser Cutter EX] at one place without moving. 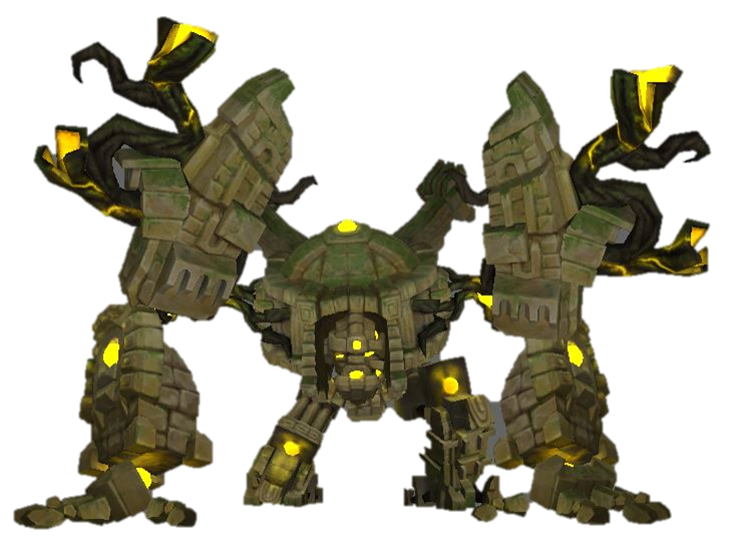 [Void Explosion]'s attack area and damage are increased and enemies are pulled while the skill is being used. After using [Void Explosion], follow up with [Switch Gravity EX] to create a gravitational field instead where [Void Explosion] used to be and strikes enemies down after launching them into the air. 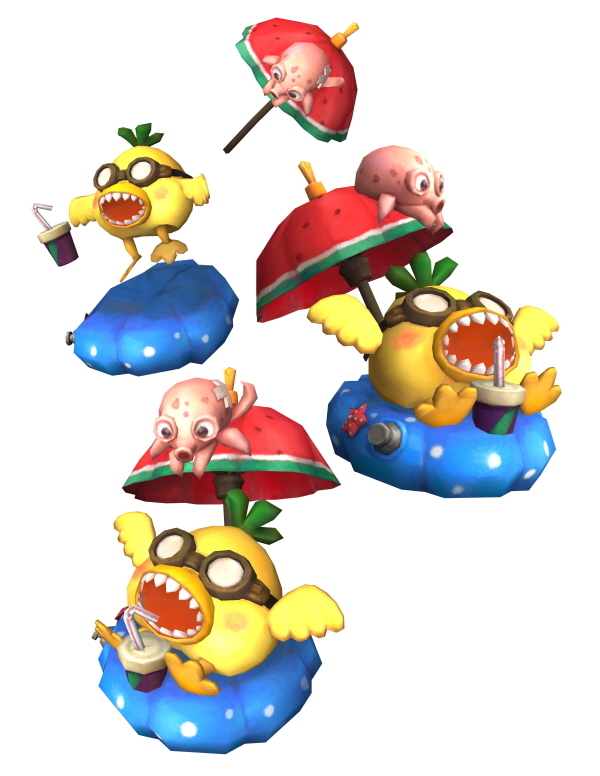 [Wheeling Staff]'s attack area and damage, and cooldown time are increased and the tornado changes to pull enemies that have been hit. After using [Wheeling Staff], enter [Normal Attack Button] to follow up with [Insult] and the flames are focused on a smaller area. [Shield Blow]’s damage and attack area are increased and attribute is changed to Light Attribute. Also, when the attack hits enemies accurately, you will get one [Guardian Bubble]. After using [Shield Blow], follow up with [Divine Vengeance] to increase action speed and damage and cause shockwaves to occur in front. [Lightning Strike]'s damage and attack area are increased. After using [Lightning Strike], follow up with [Hammer Hand] and enemies are not pushed away. 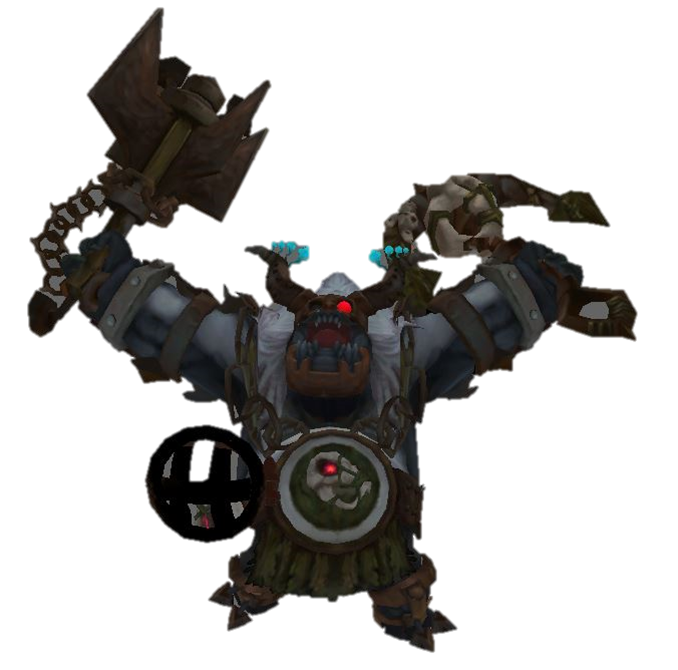 Instead the character strikes enemies in front quickly and when the enemies are hit accurately with the center of the hammer, Hammer Hand’s damage increases. [Holy Bolt]’s damage and attack area are increased and cooldown time is reduced. After using [Holy Bolt], follow up with [Blessed Sign] and holy power reaches further and deals more damage on enemies inflicted with [Bind]. [Charge Bolt]’s damage, attack area, and casting speed increases and 8 lightnings are sent on the ground. After using [Charge Bolt], follow up with [Consecration EX] to use Holy Ground rapidly. [Divine Combo]’s Magic ATK disappears, Physical ATK and attack area are increased, and cooldown time is reduced. After the additional hit using [Divine Combo]’s [Normal Attack Button], follow up with [Sawblade] to shoot blades in front and damage increases. [Quick Shot]’s damage and shooting speed increases and is changed to create one Ammo when used. After using [Quick Shot], follow up with [Splash EX] and the area of bomb explosion is reduced. [Air Shot]’s damage and cooldown are increased and when [Normal Attack Button] is entered additionally, shots are fired instead of bomb and pushes enemies away. After using [Air Shot], enter [Normal Attack Button] continuously for 4 seconds and you can quickly use [Mechanic Cannon] with enhanced Attack Power even when you’re not in Mechanic Mode. [Napalm Bomb]'s damage and attack area are increased. After using [Napalm Bomb], use [Magma Wave EX] on the flame’s trails to create additional flames on the spot and deal damage to enemies. 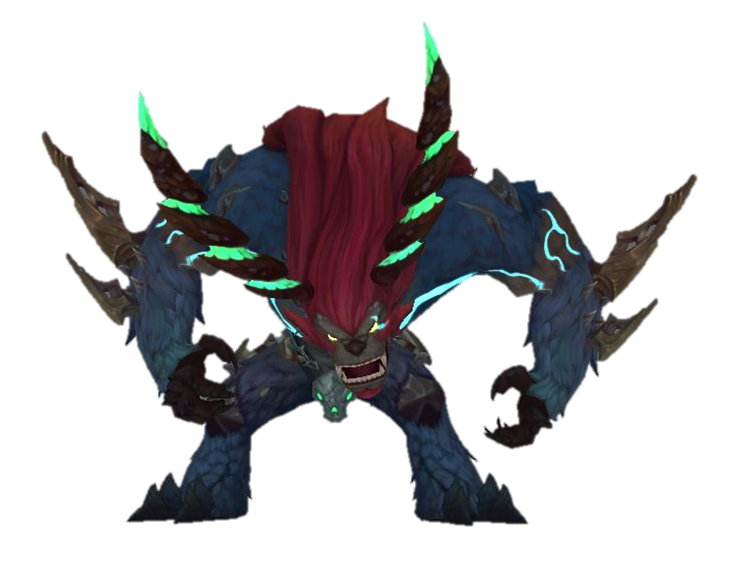 [Force Out]’s damage and attack area are increased and attribute is changed to Dark Attribute. Also, Poison Slime will appear from distorted zones. Poison Slimes will disappear after a while and when you hit them accurately with [Mixed Infection] before they disappear, poison explosion will occur. [Stun Grenade]'s damage and attack area are increased. After using [Stun Grenade], follow up with [Multiflexer] and 7 Plasma Lasers will track nearby enemies down. [Despair Needle]’s duration and attack area are increased. Also, while [Despair Needle] is being used, Attack Power and action speed increase when you enter the attack area. [Soul Wind]'s damage and attack area are increased. After using [Soul Wind], follow up with [Soul Scream] to send a phantom of vengeance in front and deal damage by hitting enemies several times depending on their size. [Fancy Turn] 's damage and attack area are increased. After using [Fancy Turn], follow up with [Squall Flaker] to turn immediately without counterattack stance and shoot up into the air to attack enemies in a large area with higher damage. Or you can follow up with [Blade Step] and [Blade Step]’s invincible duration will disappear but dance attack speed and Attack Power are greatly increased. [Spirit Blow]’s damage and attack area are increased and cooldown time is reduced. After using [Spirit Blow], follow up with [Abolisher EX] and two explosions will occur immediately on the spot, not in front. After using [Shadow Hand], follow up with [Mortal Blow] to turn immediately without pushing enemies away and damage increases when you hit enemies on the sides or the back. When you use [Mortal Blow] continuously, increased damage will be applied to all attacks. When you use [Awakened] Edged Fan, 6 Ninja Stars will spin around you to pull nearby enemies and launch them into the air. You will also gain one more [Steal] effect. [Edged Fan]’s Attack Power increases and Attribute changes to [Light Attribute]. Also, instead of throwing ninja stars, a pillar of light energy will spin nearby to attack enemies. After using [Edged Fan], follow up with [Ring Strike EX] to go up into the air immediately and send shockwaves that launch enemies into the air after landing. [Speedy Cut]’s Attack Power and area increase and attribute is changed to Dark Attribute. After using [Speedy Cut], follow up with [Plasma Burst EX] to charge in front immediately and strike enemies. [Deep Pierce]’s damage and attack area increase. When the skill is used, spear-wielding action will hit enemies as well. Also, enemies inflicted with [Vulnerable] will take fatal damage. 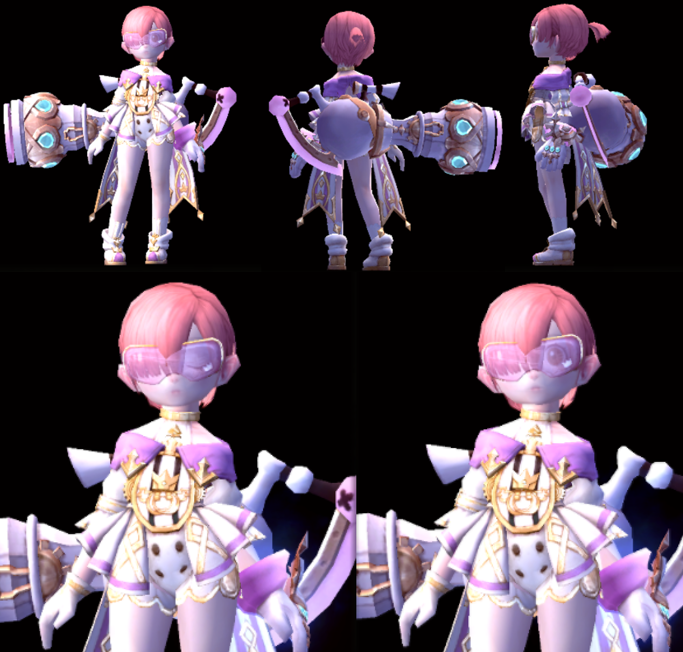 [Cross Cutter]'s damage, attack area, and action speed will increase. After using [Cross Cutter], follow up with [Dent Blow EX] to increase action speed, attack area, and damage when using the spear. [Pivot Gun Shot]'s damage and attack area are increased. After using [Pivot Gun Shot], click [Normal Attack Button] to activate [Overcharge]’s [Level 1 Charging] immediately or click and hold to activate [Level 2 Charging]. Or enter [Special Attack Button] to send a huge fist to the enemy and follow up with [Overheat EX] afterwards to use indiscriminate hits immediately. [Lariat]'s damage and attack area are increased. After using [Lariat], follow up with [Taunting Blow EX] and it will be activated immediately where the explosion strikes down and number of explosions will increase. Following the introduction of Class Mastery III, SP consumption has increased and to deal with this change, SP consumption of some skills will be changed as follows. - SP consumption has been changed from 3 to 1 when Level 1 skill is attained. - SP consumption has been changed from 5 to 3 when attained. - SP consumption has been changed from 10 to 3 when attained. escaping death is what people long for. The power to stay alive is akin to having the power of the goddess. is not a blessing but a curse. at the boundaries of the Monolith in the past. Once again, Phoenix Lavanok has returned. Mechanic learns the truth that it was Jasmine who created the XD-series clones and that they have to steal each other’s jewel for survival and become corrupted in the process. 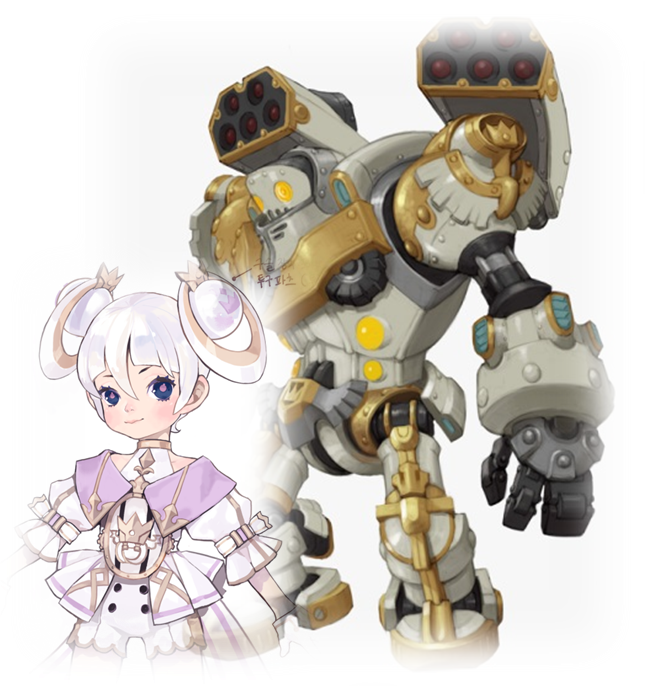 After learning that she too is one of the clones, Mechanic becomes confused but she soon meets XD-02 who appears before her with a giant Alfredo by her side. She tells Mechanic that she is a clone who managed to survive with the help of Silver Hunter and she dies after entrusting her jewel to Mechanic, along with her mission and “Alfredo Frontier” technology which can enhance Alfredo. Character creation for Ray Mechanic has been enabled. 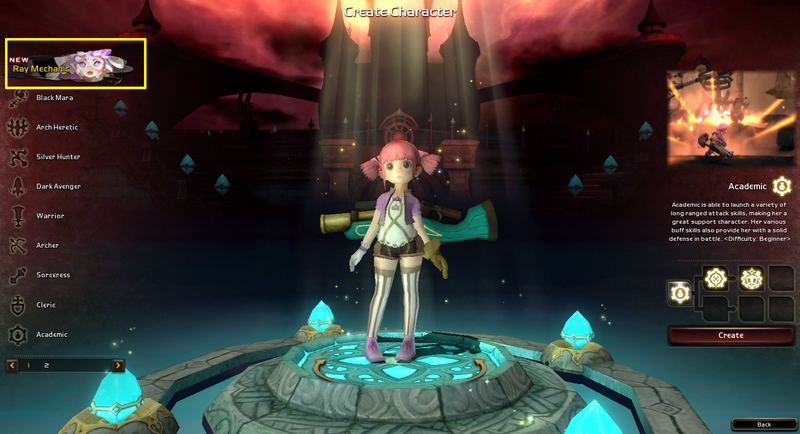 You may create a Ray Mechanic character by clicking on the class option at the top-left of the character creation screen. At level 50, you may advance from Mechanic to Ray Mechanic via the Awakening Quest, which can be taken from the Tinkerer Station, or via the Remote Quest window. All Ray Mechanic characters will receive a "Ray Mechanic Begins" box in their mailbox upon character creation. 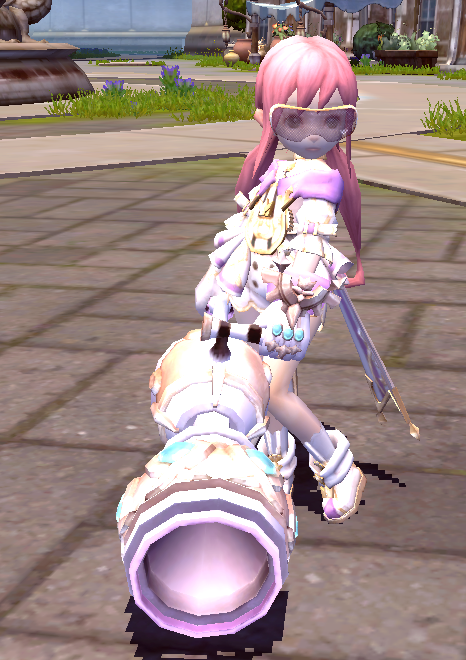 This box can be opened at level 60, and will expire after 30 days. Upon opening the Ray Mechanic Begins box, players will also get another box named "Ray Mechanic's Path", which can be opened at level 93, and will expire after 30 days. 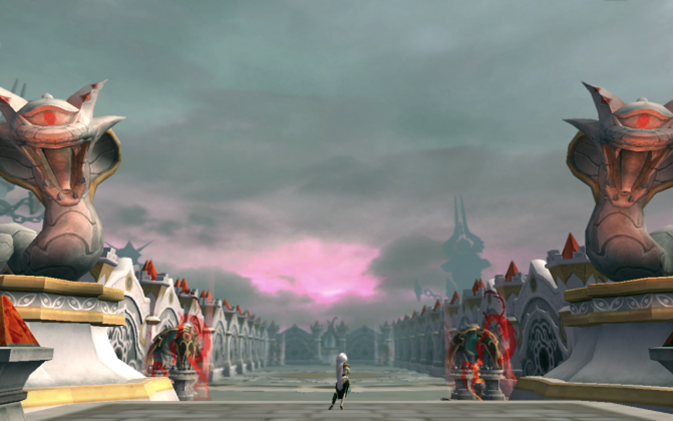 Rune Dragon Nest Practice Mode has been added. 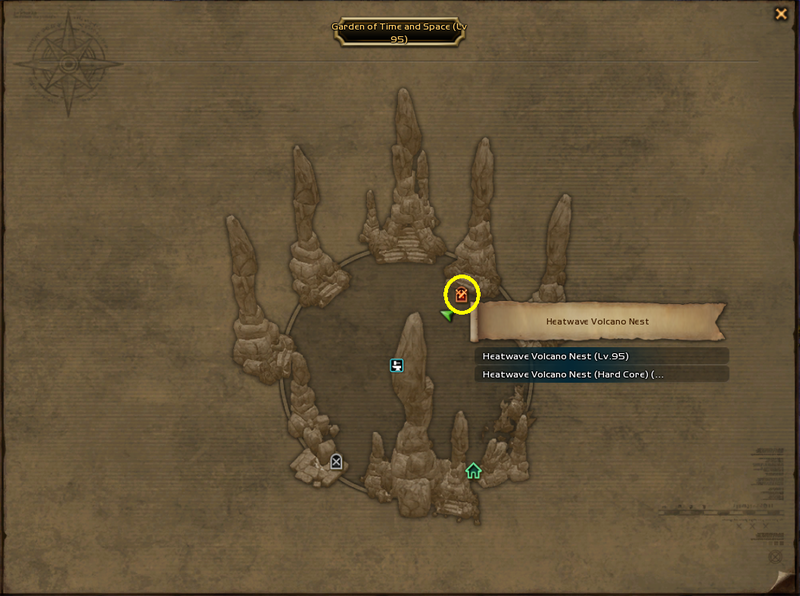 You may access it via Garden of Time and Space (lv93) > Rune Dragon Nest Portal. 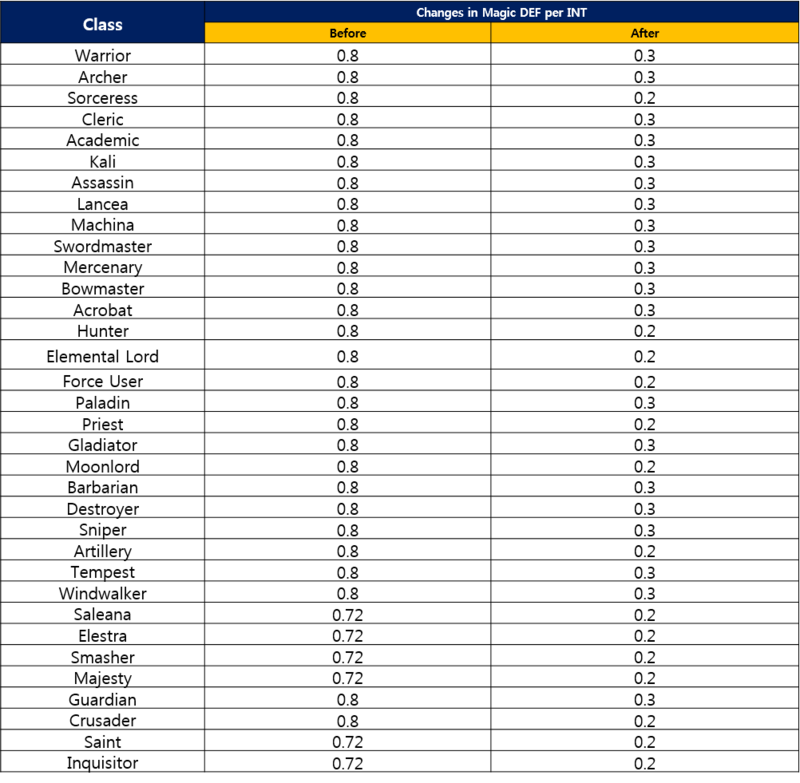 - Many problems occurred in PVP and PVE because Magic DEF increased too much due to INT. - A clear case in point would be two characters with INT as main stats participating in PVP where both of them have high Magic DEF which leads to long boring battles. 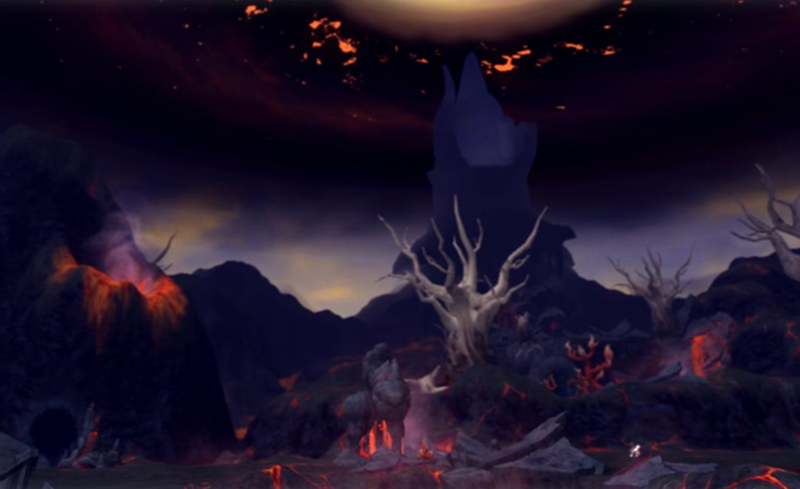 - Also, it created many problems in selecting a reference point for setting monsters’ Magic ATK. 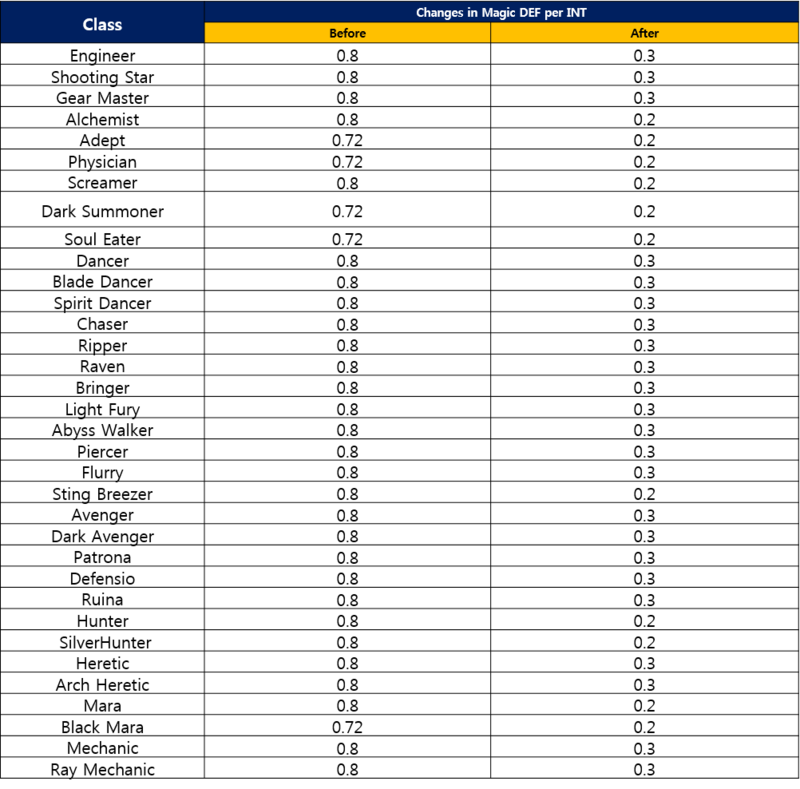 - To solve this issue, we have lowered the amount of Magic DEF increased for each INT. - Critical constant value is increased. Various equipment has been added to the game with the opening of Level 95 cap. 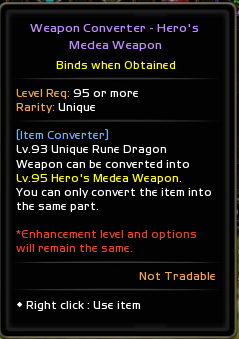 - By combining Rune Dragon Equipment with a Weapon Converter, your Rune Dragon equipment will be converted into a level 95 Hero Weapon. - Level 95 (and onwards) equipment has a maximum enhancement level of +20. - Penalty of Enhancement Level decrease has been removed. - Compared to the past, the cost of enhancement for each grade has been lowered. - Enhancement has to be done more often than before on all parts so enhancement cost has been adjusted so that users can reach the maximum enhancement level during the item release period. 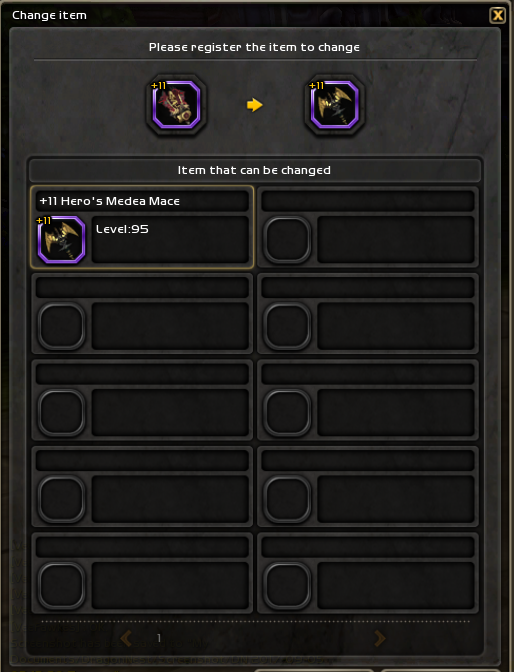 - There are no changes in the enhancement cost for items lower than Level 95. 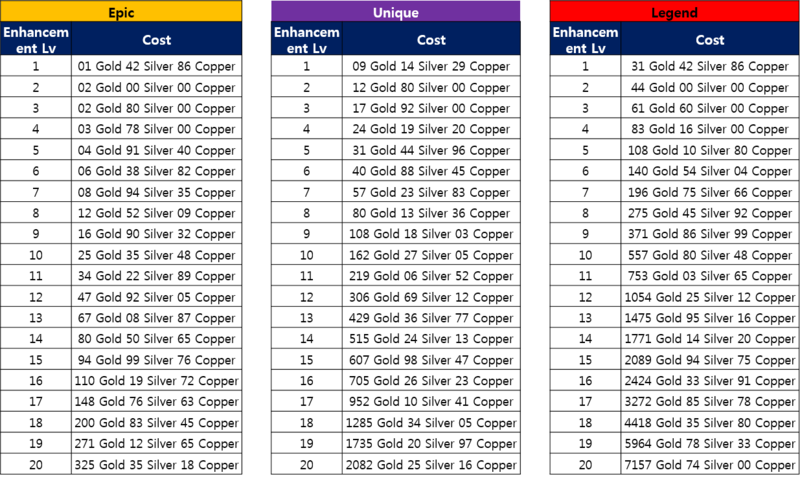 - Apart from enhancement cost, there is a difference in the required materials and quantity for each grade. 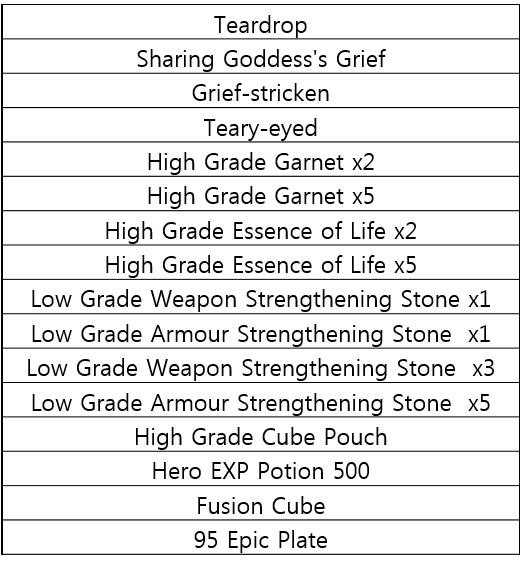 - Higher grade items will require all lower grade Strengthening Stones. * High Grade Strengthening Stones will be updated in October update. 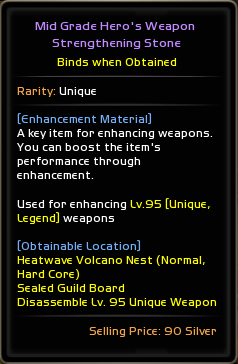 - You can upgrade Tier on an item that is at +20 Enhancement. - Upgraded items will have its Enhancement level reset to 0, but Tier level +1. * Tier Upgrade will not be available immediately after the release of Level 95 but gradually over a period of time. * Tier Upgrade cannot be done on items that have not reached +20 Enhancement Level. * For Tier Upgrades, previous tier’s [original stats + Enhancement Level 20 stats] will be the next tier’s basic stats. 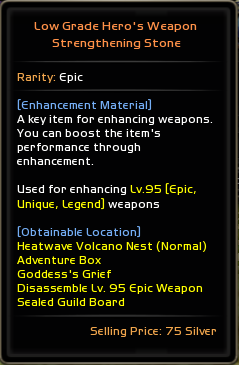 - Level 95 [Epic, Unique] grade items have been added to Equipment Collection. - With the addition of Level 95 equipment, the value you can enter in Filter has increased, from 15 to 20. - It will not be shown for items that do not have such enhancement levels. 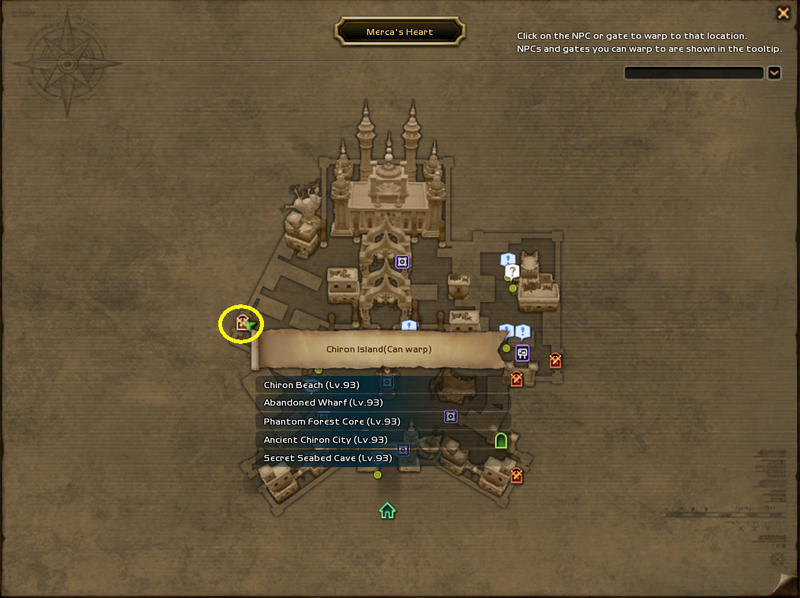 - Types of additional options that appear when you obtain equipment options will be shown. 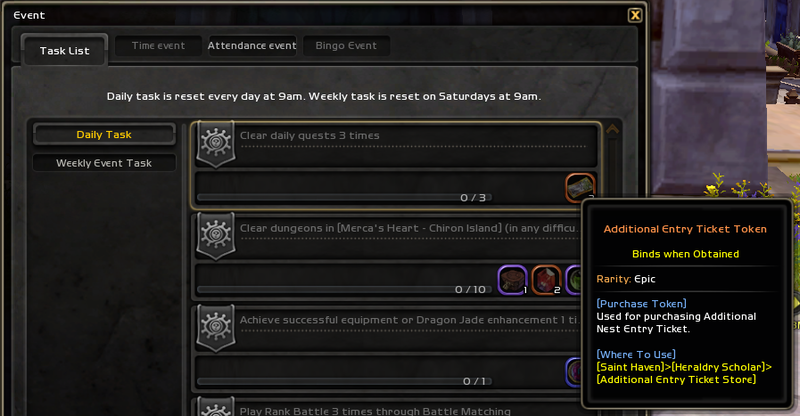 - How you obtain rewards from Remote Dungeon has been changed. 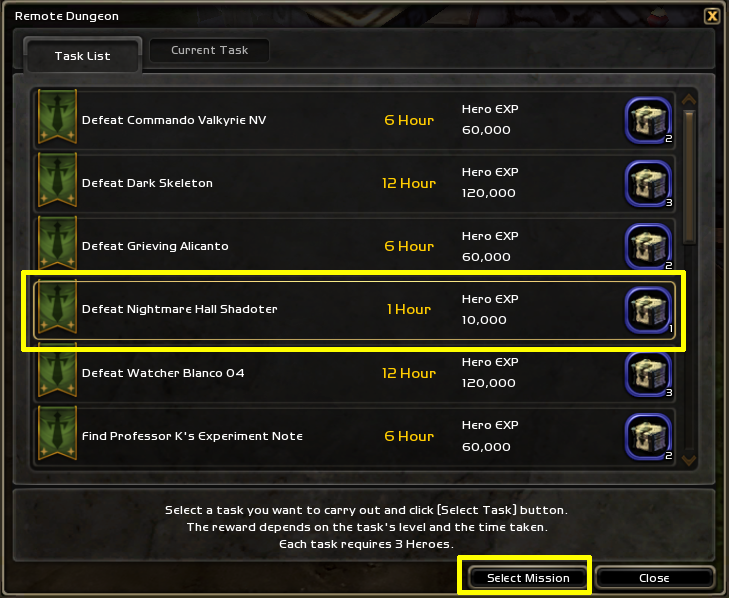 - After checking the Task Time and Reward, select the mission you want to send your Hero to and click on the "Select Mission" button. - Select 3 Heroes from the Hero list on the left. 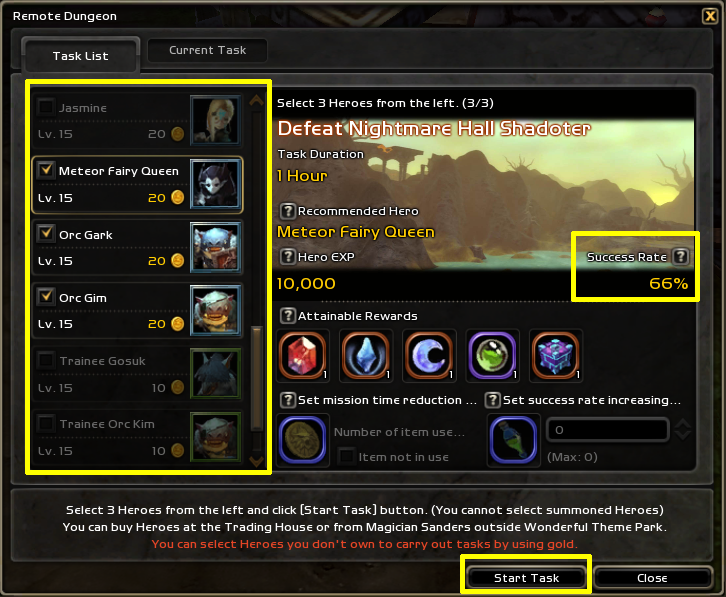 - Click on 'Start Task"
- You can check the tasks in progress in the "Current Task" tab. 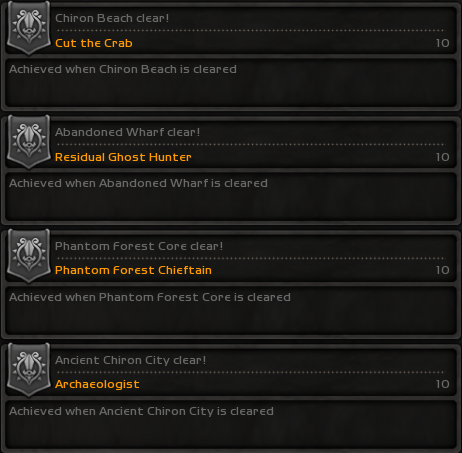 - When the time is up, double-click on the completed task to claim your reward. 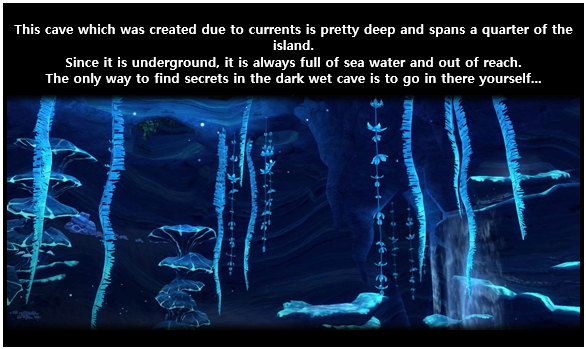 - The Adventure Box obtained from remote dungeon comes in 3 grades (depending on difficulty of task). - All Adventure Boxes will require Adventure Keys to open. 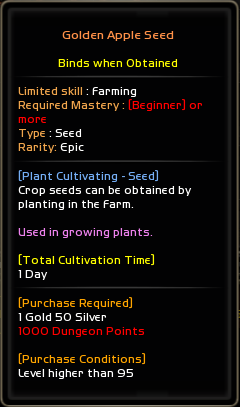 - Seeds and Apples harvested before the update will be marked as [Old] and can no longer be used. -The price of the seeds will be changed to be the same as the price sold at the store. 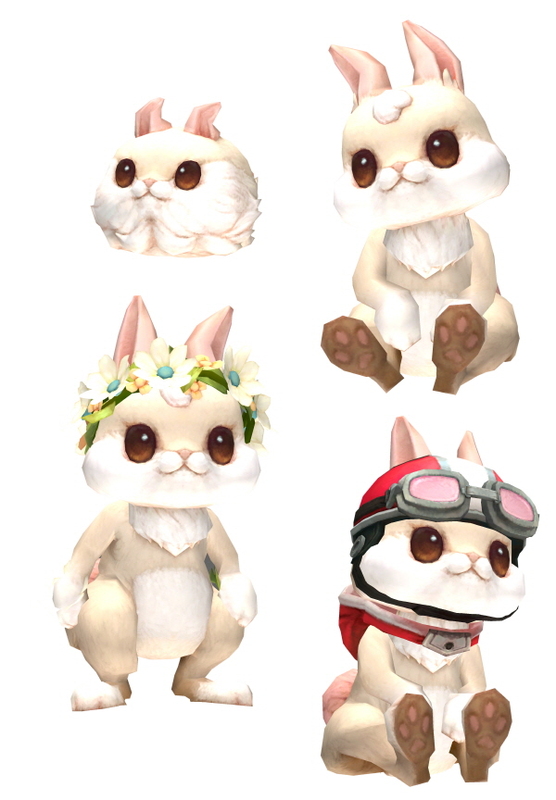 - New seeds can be bought from [Farm Manager Mori] like the old seeds. - New Golden Apple and Resurrection Apple seeds cannot be stored in Server Storage. - You need Stage Points and Nest Points to buy the items. - Price of Golden Apple and Resurrection Apple sold at the store has increased. -Level restriction for Pouch has been increased to Level 95. -Lv.93 Nest’s Additional Entry Ticket has been changed to [Additional Entry Ticket Token]. -[Dragon Jade Converter – Defence Dragon Jade] which can be used to convert Lv90~93 Dragon Jades has been added to [Dragon Jade] tab. 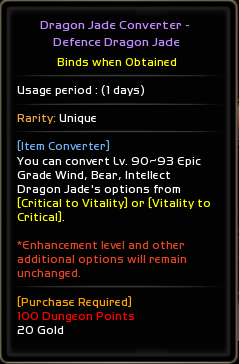 -Using this converter, you can change [Critical] to [Vitality] and vice versa. 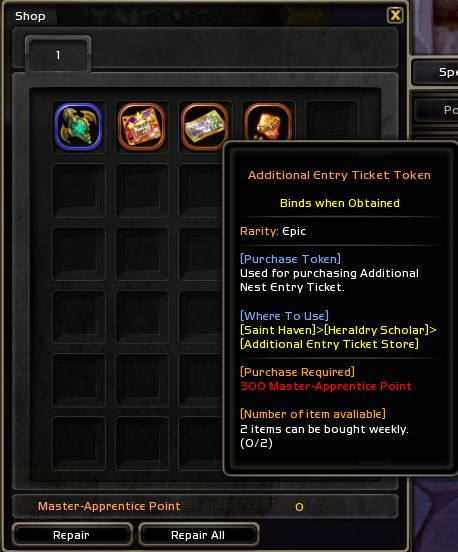 -[Additional Entry Ticket Store] has been added to Saint Haven’s Heraldry Scholar. 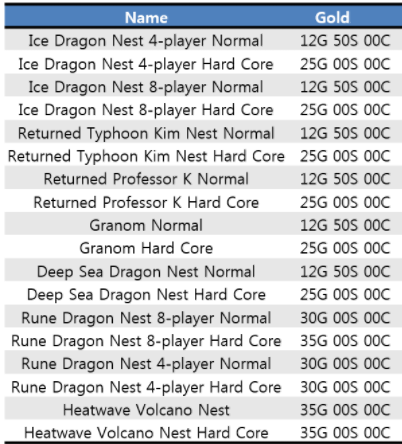 -You can buy Additional Entry Tickets for Level 95 Nest from this store. -There are Additional Entry Tickets for each difficulty level and you can buy 3 tickets for each difficulty each day. -To buy Additional Entry Ticket, you need [Additional Entry Ticket Token] and Gold. - Hero Level has been expanded to Level 75. 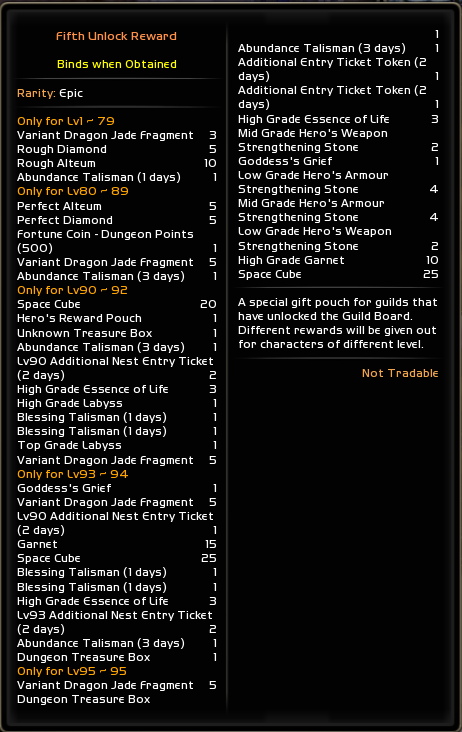 - Unlike our initial intentions, Hero's Box and Goddess's Grief Pouch have become random pouches with similar rewards. - Since the uniqueness of the random pouch was gone, we had to revamp one of the two pouches. 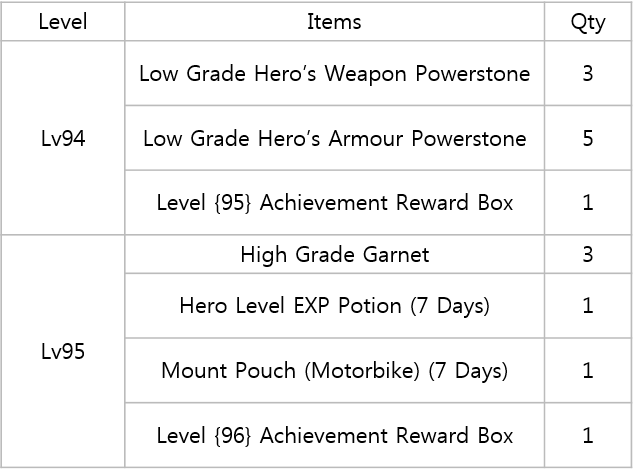 - However, we couldn’t remove the rewards that were being given so we’re replacing Hero's Box with Goddess's Grief Pouch first. 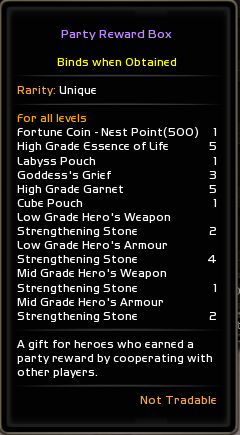 - At places where Hero’s Box was dropped in the past, Goddess’s Grief Pouch will be dropped instead. 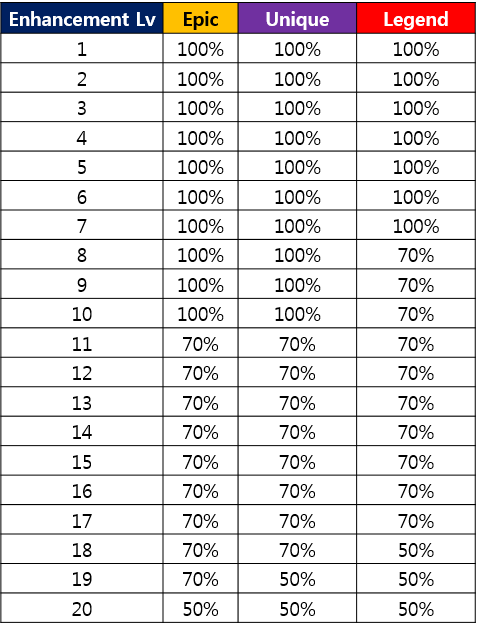 - With Level 95 expansion, rewards for Guild contents will be changed to cover Level 95. - Party reward has been changed to match Level 95. 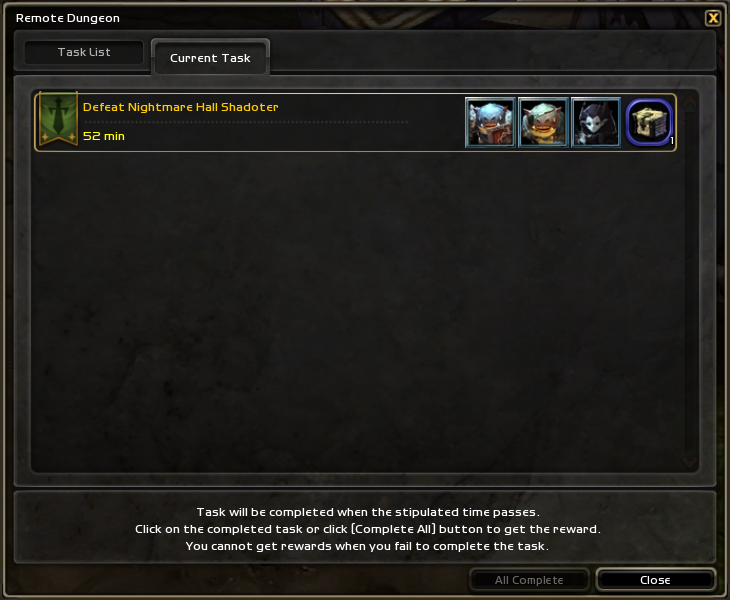 - New item has been added to Master-Apprentice Points Store. - Growth Guide’s [Contents Goals] have been revamped. - You can see Growth Guide when you reach Level 95. - You can take a new [Contents Goal] regardless of the existing achievements. - When you achieve [Contents Goals], you can get materials and equipment that are useful for Level 95. 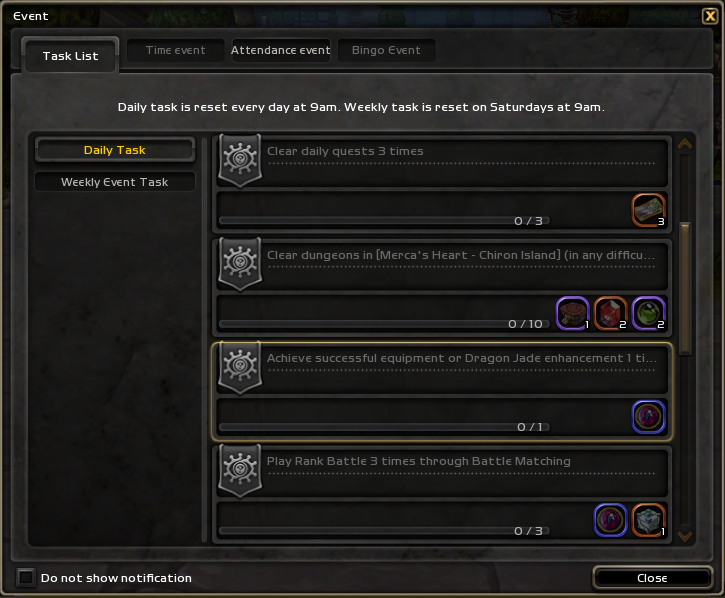 - With the Level 95 expansion, Daily Tasks, rewards, and conditions for achievement for each level section have been reorganized. - Rank Battle matching’s level restrictions has been changed to Level 95. 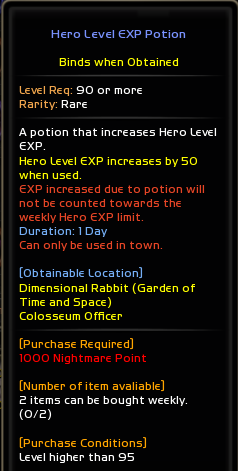 - Minimum required level to purchase Hero Level EXP potion has been changed to level 95. 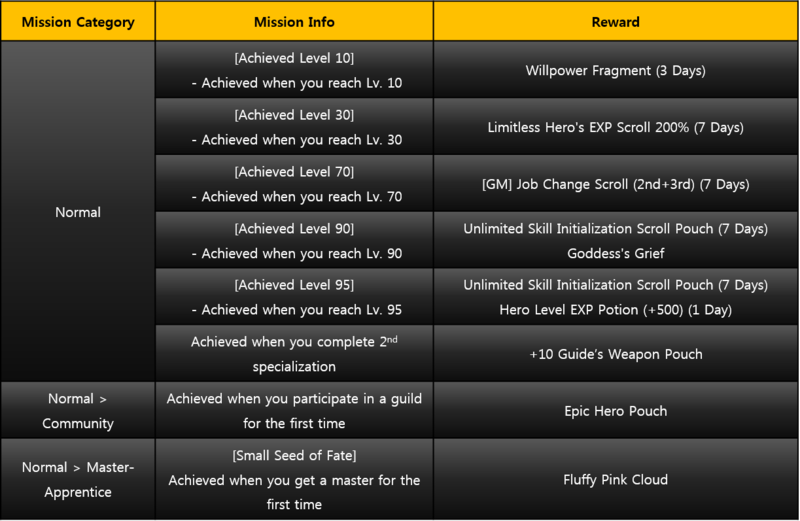 - With Level 95 expansion, some missions and rewards have been added. - Players who have already accomplished these missions cannot get the rewards. - Level 94 and 95 Reward boxes has been added. - You will get additional Gold when you clear Nests. - You can see the amount of Gold you will get on the Nest’s ‘Clear Info’ window. - Now you will get points instead of items when you [Disassemble] items or when you obtain points through [Pouch & Box] items.